Over 15 years experience in finance and communications. After studying business, Iris Albrecht began her career in consulting in 1991, focusing on marketing, PR and sales. In 1994, she co-founded “FondsKapital Individuelle Anlageberatung für Investmentfonds AG”, one of the first companies offering bank-independent investment advice and asset management with investment funds in Germany. The fund-based asset management “winConcept” claimed the top spot in 18 different performance tests. One of the keys to FondsKapital’s success was the intensive public relations work performed by Iris Albrecht. In her role as a member of the company’s Executive Board and company spokesperson, she gave the company a face and was a regular guest on TV shows and in leading financial magazines, where she passed on her expert insights into investment funds. The resulting increase in demand among private investors throughout Germany for consulting services and investment fund-based asset management led to three additional FondsKapital offices opening in Munich, Hamburg and Düsseldorf. With 30 full-time employees, five offices and managed assets valuing in the three-figure million range, FondsKapital was one of the big names among independent asset managers. After ten years, Iris Albrecht sold FondsKapital to Banque de Luxembourg which integrated it into its subsidiary Fund-Market Deutschland GmbH. Fund Market Deutschland is a joint venture between Banque de Luxembourg and Bankhaus Lampe. In her role as Managing Director for Germany, Iris Albrecht was able to successfully integrate the two companies. In addition to that, she also received a multi-year consulting contract for Banque de Luxembourg which included developing a sales and marketing strategy for BL funds in Germany and Austria. She also gave lectures in marketing and PR at the European Business School Finanzakademie GmbH in Oestrich Winkel. 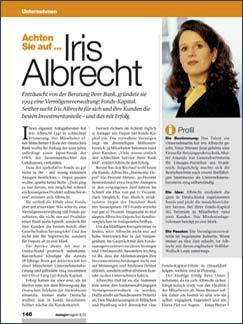 In 2008, Iris Albrecht set up her own company iris albrecht finanzkommunikation. Depending on the task at hand, she manages small, flexible teams from her well-established network of sector-related service providers and specialists.